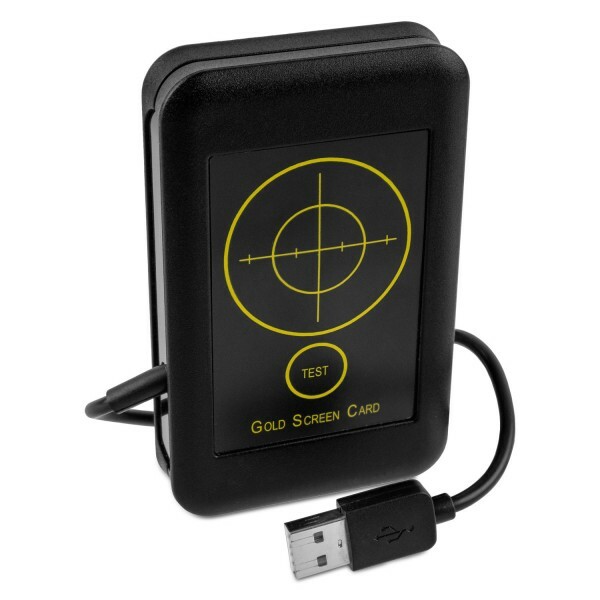 The Goldanalytix GoldScreenCard (GSC) allows you to test the authenticity of gold- and silver coins quickly and without problems. Just put the coin on the GoldScreenCard an after just one second you have a reliable result. Due to its size of only 8 x 10 cm and its weight of 40 g, the GoldScreenCard is a real lightweight. When detecting forgings, it is however a real "heavyweight". The sensor measures deeply into the coin and detects foreign metal occlusions in a depth of up to 5 mm and more without damaging the coin. Compared to that, an expensive XRF-device (cost: > 10,000 euros) only measures up to 10 µm (= 0.01 mm) into the coin. Every coin has its own "finger print" on the GSC. That means that you can test the authenticity of many current bullion coins, as e.g. Krügerrand, in a short amount of time thanks to its included database. The GoldScreenCard is also perfectly suitable for mobile use. Two programmable memory spaces make the purchase of bullion coins easier. Just connect the accumulator pack and test them on-site. For extensive measurements with graphic measurement display, just use the GoldScreenCard with the included Software (for MS Windows) and a PC. Own measurement values can also be added to the database. Related links to "GoldScreenCard (GSC)"
Instruction manual for Goldanalytix GoldScreenCard (GSC) as PDF file. Customer evaluation for "GoldScreenCard (GSC)"
Im Münzhandel bringt die Goldscreencard sehr viel. Die Messwerte sind immer präzise und liegen im richtigen Bereich. Die Software funktioniert und die Vorgehensweise ist ausführlich beschrieben. Anwenderfreundlich ist es ebenfalls. Eigene Münzen in die Software einzuspeichern gelingt z.B. ganz einfach und auch die Programmierung für unterwegs (ohne PC) ist nicht schwer. Dementsprechend empfehlenswert. Die eindeutig handlichste Varinate wenn man ein Goldprüfgerät für unterwegs sucht. Sowohl die Installation, als auch die Messungen selbst können in sekundenschnelle durchgeführt werden. Die Ergebnisse waren immer korrekt, habe gleich zu Beginn auch eine Fälschung aufgelegt - auch diese wurde unmittelbar erkannt. Für diesen Preis bekommt man in jedem Fall ein qualitativ hochwertiges Gerät mit einfacher Anwendung.